Wardlow remains relatively unknown to voters — 56 percent of those polled said they don't recognize his name. 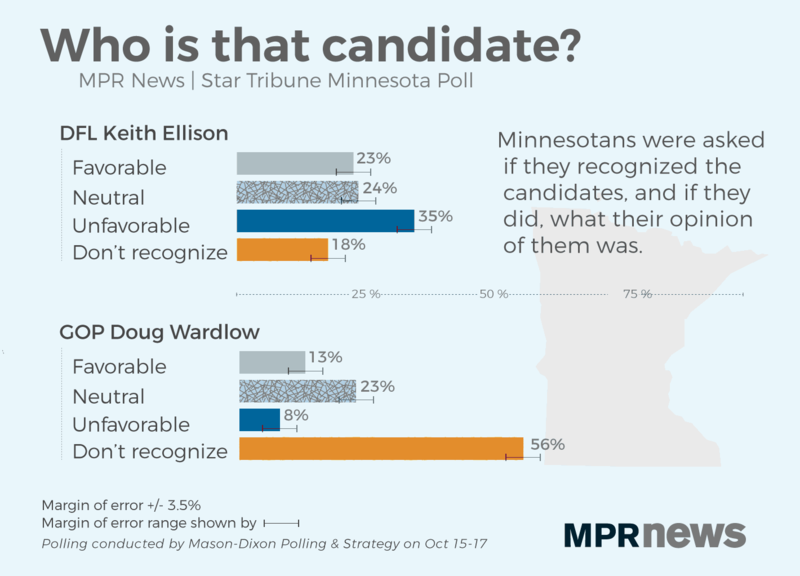 Eight in 10 voters said they recognized Ellison's name, but more said they had an unfavorable opinion of him than Wardlow. 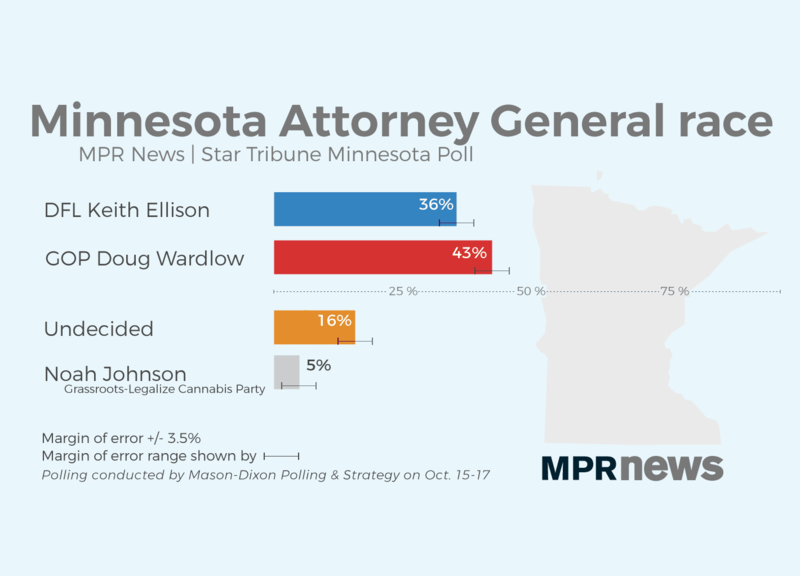 • Tell MPR: Who do you support in the AG race? 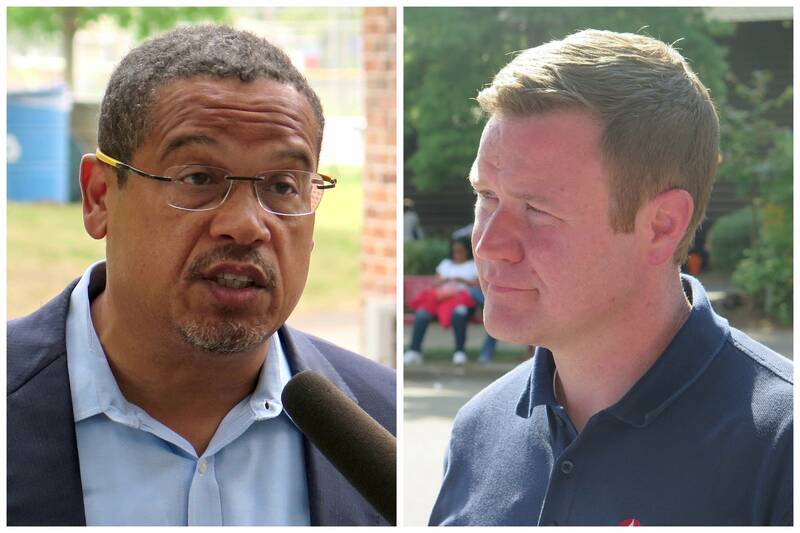 Thirty-five percent of respondents said they recognized Ellison's name and viewed him unfavorably, while only 8 percent said the same of Wardlow. The results say more about Ellison's weakness than Wardlow's strength, said Brad Coker, CEO and managing director for Mason-Dixon Polling & Strategy, which conducted the survey. "When you're a candidate running for office with that high profile and your favorable rating is more than 10 points under your negative rating, typically that means you don't have a whole lot of room to grow your support base," Coker said. Since August, Ellison has denied an allegation from an ex-girlfriend that he abused her emotionally and once physically. Last week, a Hennepin County court official ordered the unsealing of Ellison's 2012 divorce to ex-wife Kim Ellison after groups argued it was a matter of public interest. There was nothing in the unsealed divorce filing indicating Ellison abused his ex-wife. Jay Thomas, a poll respondent from Otsego, said he will vote for Wardlow. "Well, it's not so much that I like him," he said. "It's that I don't like Ellison." Thomas was among the 30 percent of poll respondents who said they believe the allegation of physical abuse against Ellison, a 9-point rise since September. Twenty-one percent of respondents said they did not believe the allegation and 49 percent were unsure. "If they could prove that Ellison was innocent, that could change my vote," Thomas said. "But I don't see that happening. Until that does happen then he will not get my vote." Grassroots-Legalize Cannabis candidate Noah Johnson was also included in the poll and earned support from 5 percent of poll respondents, the same level of support he earned in September. Johnson recently threw his support behind Ellison. The poll of likely voters was conducted by Mason-Dixon Polling & Strategy between Oct. 15 and Oct. 17. It has a sampling error of plus or minus 3.5 percentage points, meaning that there is a 95 percent probability that the "true" figure would fall within that range if all voters were surveyed. The poll showed Wardlow with an advantage among men, all voters older than 34 and among voters in every region of the state outside of Hennepin and Ramsey counties. "Wardlow is ahead when you ask specifically about the attorney general's race and identify his political party. But one of the first questions in the poll tapped name recognition and favorability without any of that context, and over half of likely voters failed to recognize his name — including over one-third of Republicans," said Craig Helmstetter, managing partner of the APM Research Lab, a sister organization of MPR News that specializes in analysis of demographics and surveys. Walt Flynn of Apple Valley is another voter who sees his support of Wardlow as a vote against Ellison. "I don't know about his personal situation. I choose not to try to judge that kind of stuff too much. I have no line of sight to that," Flynn said. "But I just have never liked his politics and have been concerned about his kind of almost radical stands on different issues when he was a congressman." Ellison continues to have an edge among women voters and younger voters, ages 18 to 34. Carol Lowe of Richfield has voted for Ellison in past congressional contests and plans to do it again in this year's attorney general race. "I was unhappy with the accusation from his ex-girlfriend," she said. And while I definitely support survivors and I definitely believe much of what is in the news, this one didn't just ring true as much. So, that didn't dissuade me from supporting him." It's been nearly 50 years since a Republican was Minnesota's attorney general. Walter Rockenstein, a poll respondent from Minneapolis, happened to have worked in the office at that time under former Republican Attorney General Doug Head. He also worked for Head's successor, DFLer Warren Spannaus. Rockenstein said he supports Ellison and was offended by Wardlow's recent remarks about wanting to fire 42 Democrats as he enters office and replace them with Republicans. "I was really turned off by that comment," Rockenstein said. "I think that's the wrong approach to the way you run the attorney general's office."